Lucy: I have an idea. After three highly rated, consistently hilarious seasons on CBS-TV, I Love Lucy found itself at a creative crossroads. The series' domestic storylines, though still funny and relevant, risked becoming repetitive, even stale, without the addition of some kind of clever twist or hook. The birth of Little Ricky at the end of Season Two provided the necessary shot-in-the-arm for Lucy's third season, but the writers wisely resisted the family sitcom trap so many other shows of the era willingly embraced. The crux of I Love Lucy had always been the battle-of-the-sexes tension between Lucy (Lucille Ball), Ricky (Desi Arnaz), Ethel (Vivian Vance), and Fred (William Frawley), and to monkey with that million-dollar formula by having the Ricardos resemble the Nelsons (of The Adventures of Ozzie and Harriet) or the Williams (of Make Room for Daddy) seemed idiotic, if not suicidal. The story arc the writers finally devised for Season Four brilliantly satisfies the need for changes, while remaining true to the series' vital core. In a rash but inspired move, the Ricardos leave the cramped confines of their New York City brownstone, break free from Little Ricky (who is left behind with Grandma McGillicudy), and hit the road. And what better place to go than Hollywood, a locale bursting with new situations, not to mention a stable of potential big-name guest stars who could plausibly stumble into Lucy's world and become willing comic foils. The change of scenery liberates the show, and watching Lucy and Ricky navigate unfamiliar terrain adds newfound sparkle to the pair's combative form of comedy. When MGM casts Ricky as Don Juan in a splashy Hollywood epic, the wheels are set in motion for a cross-country trek and memorable working vacation. Of course, the Mertzes tag along for the fun, and such celebrities as William Holden, Van Johnson, Rock Hudson, Richard Widmark, Cornel Wilde, Eve Arden, Hedda Hopper, and Harpo Marx (with whom Lucy shares a classic pantomime routine) make memorable appearances. The storyline also allows Lucy Ricardo to pursue her own dreams of show business success with a single-minded vengeance unmatched in previous seasons. The Tinseltown backdrop provides unlimited fodder for her outrageous schemes and riotous misadventures, and Lucy maximizes every comic opportunity. In Lucy Gets in Pictures, the notorious redhead wins the part of a glamorous showgirl in an MGM musical, but quickly discovers moviemaking is a lot harder than it looks when her towering, leaden headdress (a la Carmen Miranda) makes the simple act of a descending a Ziegfeld-like staircase treacherous business. The episode showcases Lucy's gift for physical comedy, as does L.A. at Last, in which a starstruck Lucy gets more attention than she bargains for from William Holden after she stares too long at the hunky actor from an adjacent booth at the famed Brown Derby restaurant. In addition to a clever bit with a bowl of spaghetti, Lucy creates one of the series' most indelible moments when she dons a putty nose that ends up catching fire when Holden lights her cigarette (see cover art above). Other notable episodes include Lucy impersonating a blonde bombshell (Marilyn Monroe, perhaps?) to get a talent scout's attention in Ricky's Movie Offer, dressing up as a bellboy to meet actor Cornel Wilde (and getting trapped on his hotel balcony) in The Star Upstairs, and encountering a hick gas station attendant (portrayed by a very young Aaron Spelling�yes, that Aaron Spelling!) in Tennessee Bound. And for this transplanted New Mexican, it's always a treat to watch Ethel visit her hometown of Albuquerque and witness the confusion that erupts when the townsfolk believe she's the one who's landed the big movie contract, not Ricky. For many fans, the Hollywood episodes of I Love Lucy mark the series' undisputed high point. The glamorous locale, fresh storylines, and numerous guest stars add luster to an already well-established show, and the writing and performances remain as sharp and funny as ever. In fact, the traveling concept works so well, the Ricardos and Mertzes will barely get a chance to unpack their bags before shuttling off to Europe in Season Five. And I can't wait to stow away. Image Transfer Review: Paramount once again treats this iconic show with the care it deserves, and the newly restored transfers match up perfectly against those of previous seasons. Rich, inky blacks and a widely varied gray scale help produce superb clarity and depth of field, and only a faint smattering of print defects and minimal shimmering disrupt this silky smooth presentation. Without a doubt, Lucy fans will be thrilled with Paramount's effort. Audio Transfer Review: Typical of early TV audio, the mono track sounds a bit tinny and harsh, but any surface noise has been thankfully scrubbed away. Dialogue remains clear and comprehendible throughout, and the recognizable score possesses good fidelity. Spanish language audio is also available on most�but not all�episodes. Extras Review: The same comprehensive array of extras that graced previous I Love Lucy collections also compliments this current edition. All the discs include a selection of interesting flubs, restored footage, original series openings and animated sequences, rare public service announcements featuring Lucy and Desi, and�my particular favorite�comprehensive guest cast information. (Even the well-known Hollywood stars who appear in several episodes receive mini-bios.) Five complete installments of Lucy's popular radio show, My Favorite Husband (which inspired I Love Lucy), and an audio selection from head writer and producer Jess Oppenheimer's memoir, Laughs, Luck�and Lucy!, provide additional entertainment and insights. Fascinating production notes divulge that the putty nose Lucy employed to disguise herself from William Holden in L.A. at Last was the comedienne's "favorite comedy bit" of the entire series, and that when the Ricardos embark for California and drive across New York's George Washington Bridge, viewers of the day were treated to television's first processed background. We also learn Vivian Vance's husband, Phil Ober, stepped in at the last moment for Dore Schary when the MGM studio chief couldn't appear in a pivotal episode. To make the notes more interactive and involving, the disc intersperses stills, film clips, and script excerpts throughout the text to illustrate various points. A selection of rare behind-the-scenes photos and footage rounds out the extensive supplements. Look out, Hollywood! Anything can happen (and usually does) when the Ricardos and Mertzes arrive in the movie capitol, and their slapstick antics turn Tinseltown on its ear. 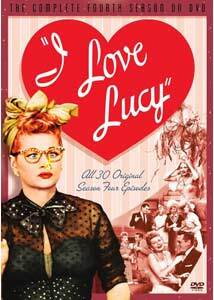 Anyone who appreciates classic TV should invest in this wonderful collection of some of I Love Lucy's best episodes, all beautifully restored and brimming with extras. Highly recommended.